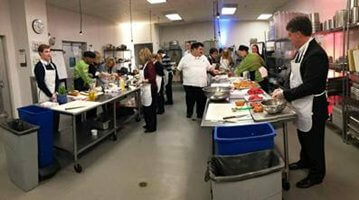 The Legacy Trust staff celebrated the company’s 10th Anniversary in high stakes fashion – in the kitchen. 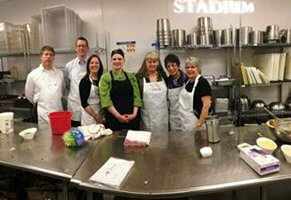 Team Divas (Brian Moore, Keith Millhisler, Randii Smith, Sandy Beurkens, Jeanette Pigorsh and Laura Drabczyk) faced off against Team Wimpy (Christi Powers, Hilary Roelofs, Melanie VanderHoff, Laina Mills, Brian Balke, and Gavin Anderson) in the JW Kitchen Stadium for an iron chef battle of best burger. The two teams, dressed in their special 10-year anniversary aprons, were faced with the challenge of creating their unique version of a salad and a burger from the ingredients prepared by the Six.One.Six kitchen at the JW Marriott. 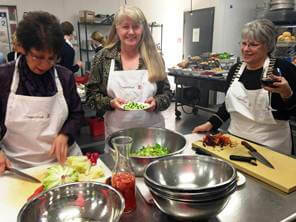 Assisted by Chef Heather, Team Divas prepared a sweet, fruity salad and a southwestern-style burger. 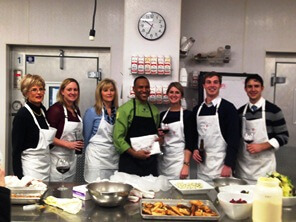 Team Wimpy, with the help of Chef Steven, prepared a spring salad paired with goat cheese fritters and a blue-cheese stuffed turkey burger. Both dishes were presented to our judges – Executive Chef Christian Madsen, Mary Ann Sabo from SaboPR and Jen Crowley from Highland Group – where they judged on both flavor and presentation. 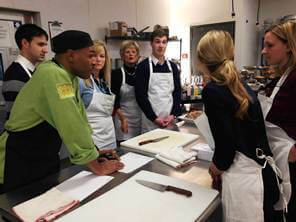 After judging, the staff gathered in the restaurant to enjoy their creations and share memories from the last ten years. Team Wimpy was crowned the winner at the end of the night. We all look forward to the next ten!